What do you do if you need a patio table and it’s just not in the budget to buy one? 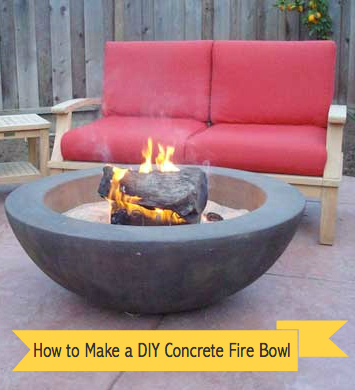 No problem for a DIY-er like yourself: make one! Repurpose an old metal wash tub into a fabulous outdoor coffee table. We’ll show you how. If you don’t have an old metal tub laying around, you can find them at farm supply stores and hardware stores. Round or oblong, these tubs are usually low enough to make the perfect table or even a foot stool. Smaller buckets make great side tables or ottomans. Decide how large you want the table top to be. A good size is three inches wider than the diameter of the bucket. The inside of the tub makes great storage space, so consider whether you want to permanently attach the table top to the bucket or build it so you can lift it off for easy access. Trace the outside diameter of bucket onto the plywood – Mark 3-inches outside of that line for where you will cut. (Optional) Make the top a lid – Draw a second circle and cut 1-inch inside the diameter of the circle. Cut the circles with the jigsaw. Glue the smaller circle onto the larger one – The smaller one will fit inside the bucket and hold the lid in place. Add liquid nails glue to the larger circle – Add the boards to plywood. Allow 24 hours to dry. Cut the boards in the shape of the larger circle. (Optional) Screw the boards to the larger circle – This will keep them from shifting if glue fails. Sand the top and edges of the table top. 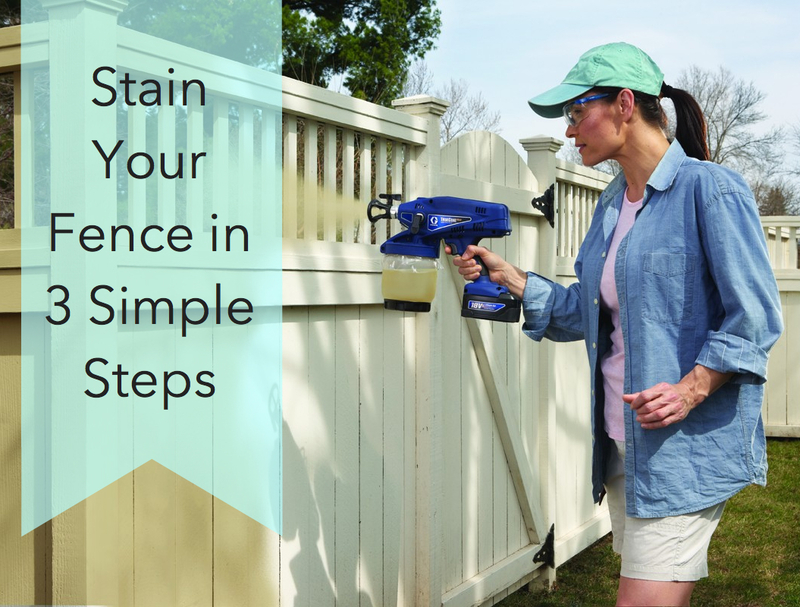 Stain or paint and coat with a polyurethane protectant. If you don’t want to use the inside for storage, consider adding sand or a concrete block to give the table weight so it won’t blow around. You can permanently add the table top onto the bucket by flipping the bucket over and applying liquid nails to the edge. Place the plywood on top and allow to dry. Caulk between the plywood and the bucket to protect against moisture. Create an ottoman with a smaller bucket. Glue 2-inch foam padding to a small plywood circle and cover with outdoor fabric. Keep the fabric taunt and staple it on the underside. The covered circle fits inside the opening of the bucket. If you want the ottoman as additional seating, then be sure to place a concrete block inside the bucket to support the covered seat. Repurposing old items into useful patio furniture is a fun weekend project. It is a great way to save money, while unleashing your inner creative side. So next time the wind blows your patio furniture off the deck, leaving it in tatters, don’t sweat it. Just laugh and head to the garage, surely you have a few extra buckets laying around. Take that wind! From jigsaws and drills to sanders and staplers, our expert staff is always on hand to help you find the right equipment for your next outdoor DIY project. Want to create more repurposed outdoor furniture? Check out our blog on building a DIY Outdoor Couch to Enjoy All Summer Long. As always, if you have any questions about what to choose, pricing or how-to’s, don’t hesitate to contact us. Stop by our store — we’re open seven days a week. Get Decked Out for Entertaining with a New Deck! Do you never have enough room to entertain family and friends? Consider adding a new deck. Having the extra space to cook out or enjoy a quiet summer evening is one reason why building a deck is such a popular DIY project. It adds to the beauty of your home and increases the overall value of your property. With so many materials to choose from, the decision really comes down to what is important to you – maintenance free, natural beauty, or cost? Budget and personal preference are what usually determines the materials used. Do your research though. Some wood materials are beautiful but dense and difficult to drill. You will need special equipment. Pressured treated lumber – The most popular, this material is inexpensive, pest resistant, and easy to install. It can split and crack if not treated every 1-2 years. Yearly power washing is recommended. Redwood and cedar – More expensive than pressure treated lumber, they resist decay and pests. To keep their natural color, a preservative will need to be applied every 2-3 years. Left untreated, the wood turns a soft shade of gray. Tropical woods – These exotic materials (massaranduba, ipe, and tigerwood) are durable and beautiful but pricey. They are dense hardwoods which makes them difficult to cut and drill so special installation is required. They also do not accept stains well. Composite – This material is made from wood fibers and recycled plastics. Though more expensive than pressure treated lumber, it comes in a variety of colors, is weather and stain resistant, and very low maintenance. Prone to mold and mildew, a yearly power wash is a must. Plastic – Since it contains no wood, this material is virtually maintenance free. It does not have the look of real wood but it also doesn’t have the upkeep. Who Says a Deck Has to be Square? Think outside the box, don’t limit your design. No one said you had to build a square deck. Opt for a multi-leveled deck that flow out from your home and into your garden. Consider wrapping the deck around your house to allow other rooms to open out onto your new space. Whatever your design, remember to check local building codes. Depending on the size of your deck, you may need to apply for a building permit. If you plan to entertain a large number of people on your deck, invest in additional supports and make sure the substructure can handle the excess weight. Keep your guests safe. Will your deck be attached to the house or freestanding? To build the safest, most durable structure possible, avoid the temptation to skimp on fasteners, nails or screws. Buy a high quality, non-corrosive material like stainless steel. Inferior screws and nails will corrode, discolor and shorten the life of your deck. Wood materials have imperfections – Sort through your lumber, choosing the best boards for highly visible areas. Keep pieces with defects for out of the way sections. Create a solid base for your deck – Set your foundation posts in concrete and allow them to set before continuing your construction. Make sure your deck is level – If attaching a deck to your house, make sure the ledger or board you secure to the outside wall is securely fastened and level. Space your boards – Lay boards 1/8” apart to allow for expansion and contraction. Protect it – Applying a weather-proofing finish will guard your wood against the elements and keep it looking great. Once you have your deck completed, go wild and decorate! Don’t be afraid of adding color. Deck stains now come in a wide assortment of colors. Add a pergola for some additional shade, install outdoor speakers or hang flower boxes from the railings. The sky is the limit so get out there and fire up that grill. Your company is coming. From circular saws and drills to augers and concrete mixers, our expert staff is always on hand to help you find the right equipment for your next DIY building project. A new deck needs some pizzazz! Learn how to add decorative outdoor lighting in our previous blog “Outdoor Refreshers – Install Decorative Outdoor Lighting”. As always, if you have any questions about what to choose, pricing or how-to’s, don’t hesitate to contact us. Stop by our store — we’re open seven days a week. It’s springtime and those pesky weeds have been lying dormant all winter just waiting to burst forth. Never fear, we have the 4-1-1 on how to cut them off at the start; saving you time and money. Effective weed control is easier than you think. Weed Worries Got You Down? Weeds are sneaky little buggers. They sleep all winter long and pop their heads above ground at the first sign of warm weather. Weed seeds are in virtually everything from potting soil to grass seed. In fact, the more you disturb the soil the more seeds you are exposing to moisture and sunlight needed for germination. So what are you to do? Minimize disturbing the soil – When maintaining your garden avoid digging or hoeing below the top 1-2 inches of dirt to limit the amount of seeds exposed. When planting be sure to cover the freshly turned soil with thick layer of mulch. Mulch – Keep the seeds in the dark! Cover areas around plants with at least 2 inches of mulch. Organic mulches contain weed eating crickets and beetles that devour seeds. Make weeding easy – The old saying “pull when wet, hoe when dry” still applies. Pulling weeds in the early morning when the ground is damp will make the job go faster. Deadhead – This practice isn’t just for flowering plants. By pulling the tops off weeds you are eliminating the seed pods that could drop and germinate. Limit gaps between plantings – Too much space encourages weeds to grow. Consider mass plantings or tightly spaced beds to leave no room for weeds to appear. Keep your tools sharp – Dull hoes can spread weed seeds instead of eliminating them. You want to slice through the weed’s root to kill it. Water plants, not weeds – Burying your soaker hose beneath mulch can reduce seed germination by 50 -70 percent because your plant is building strong roots and crowding out the weeds. Maintain a healthy soil – Fresh infusions of organic matter or compost into the soil will help keep it healthy and keep seeds from sprouting. Self-leveling sealant – Fill cracks in concrete with this expanding filler to block weeds. Sealing cracks will extend the life of your surface. White vinegar, salt and dish soap – Combine these with water and spray it on weeds shooting up through cracks. It will cause them to wilt. Salt – Spread left-over rock salt on weeds and watch them dry up. Avoid runoff into your grass and garden because salt will totally kill vegetation. Polymeric sand – Used to fill between bricks and pavers, you can also use this to fill concrete cracks. It has a cement-like quality once wet so work it into the cracks and sweep excess away. Burn weeds away – Use a propane powered weed scorcher or handheld blow torch to run the flame over the weeds to shrivel them up. You are not setting them on fire but depriving them of moisture. Be careful in drought stricken areas. Weeds are a fact of life but they don’t have to ruin your gardening experience. By taking these simple steps you will cut your weeding workload down to a manageable level and finally have more time to actually stop and smell the roses. From wheelbarrows and shovels to weed eaters and bark blowers, our expert staff is always on hand to help you find the right equipment for your next DIY landscape project. Learn how to improve your garden and flowers with organic compost in our previous blog “10 Good Sense Tips for Building a Compost Bin”. As always, if you have any questions about what to choose, pricing or how-to’s, don’t hesitate to contact us. Stop by our store — we’re open seven days a week. Finally, the long-awaited spring season is here, along with its warmer weather, sunshine, and rainy days! With that said, now is the time to start designing and planning for the garden of your dreams. Liven up your outdoor space by creating a garden of beautiful, fragranced flowers. Or perhaps you would like to take that extra step toward self-sufficiency this year and home-grow your produce. Well, if so, you are in luck! We have put together an easy-to-follow beginner’s guide for growing a productive vegetable and fruit garden, and best of all, we have tailored it for the Indiana harvesters. Enjoy local, healthier, home-grown food straight from your backyard by following this simple guide! Please remember that we have a variety of gardening tools for rent and purchase here to help you accomplish any gardening task headed your way– from aerators and lawn mowers to wheelbarrows and tillers – we got you covered! Ever wondered what to do with an outdated old chandelier? Renovations often leave us with items we have no clue what to do with. Do you donate them or throw them away? Many times they lay forgotten and unused in the attic, just waiting on a second chance. Give your old chandelier a new lease on life by turning it into an elegant bird feeder. Yard art can add interest and fill in blank areas of your garden where plants have a tough time growing. Repurposed items like chandeliers add a sense of whimsy and fun to formal gardens and are great conversation pieces. Start by taking the electrical elements out of the chandelier. Remove the light fixtures and wires. Next apply waterproof glue to the bottom of a bowl and place one on each arm. Allow the glue to dry overnight before attempting to paint. Break out of your comfort zone and use bright, fun paint colors (the birds won’t mind). Hang the chandelier from a low tree branch so you can easily cover all sides at once. If you prefer, paint one side, allow time to dry and then flip it over to paint the other side. Paint hides imperfections like excess glue or rough spots. Once dry it is ready to hang from your favorite tree with the “S” hook and chain. You don’t have to hang your bird feeder from a tree, instead mount it on a painted wooden spindle to create a candelabra feeder or place it on a fence post. Add some “bling” to your chandelier by hanging colored crystals from the arms. Mismatched forks and spoons can act as wind chimes. Set your imagination free and decorate your feeder to reflect your personality. Repurposing old items is addicting. Don’t stop with just your birdfeeder. A chandelier can also make a beautiful planter. Substitute terra cotta pots for the bowls and you are ready for planting. Old lamp bases with china platters added on top make unique bird baths. Wheelbarrows make great planters or bird baths. An old sink or bath tub can make convenient raised garden beds. Add bird houses to your chandelier instead of seed bowls. Reusing old items keeps them out of our landfills and gives you an inexpensive way to add color and creativity to your garden. Get busy and convert some of your would-be trash into outdoor treasures. Your guests will be impressed by the clever, artistic touches in your yard. From drills and saws to ladders and paint sprayers, our expert staff is always on hand to help you find the right equipment for your next garden DIY project. Want to make your garden an inviting habitat for wildlife? Find inspiration and helpful tips in our previous blog, “How to Attract Birds and Butterflies for a Livelier Yard”. As always, if you have any questions about what to choose, pricing or how-to’s, don’t hesitate to contact us. Stop by our store — we’re open seven days a week. Are you excited about Spring? We sure are! Like you, we can’t wait to start working on our gardens. Time to get a game plan together and decide which DIY project to start on first. Why not create a captivating garden path using stepping stones? Simply trail them throughout your landscape and lead visitors on a magical tour. Garden paths are used to draw interest to out-of-the-way sections of a landscape or to highlight features like ponds, trellises, or gazebos. The style of your home and grounds should dictate the location type of path to create – formal or informal. Use – Heavy foot traffic will need sturdy materials like stone that won’t break easily. Cost – Come up with a budget and then shop for materials. A lengthy path will require a lot of materials. Shape – Consider curving paths as well as straight-lined walkways, which can reveal your garden as you walk. Mix it up – Combine materials (pavers/concrete or stones/mulch) to add interest. Create contrasting borders or patterns. Sun or Shade – Dark stones absorb heat, which could make them too hot for bare feet. Smooth stones often remain slippery if in damp areas. Lighter colors and textures are neutral and may be your best option. Hard work – Moving pavers, gravel, or stones around is exhausting so recruit volunteers to help or spread the job out of time. Once you’ve decided where you want your path, pick your materials. For formal paths, many choose brick pavers or flagstone. Informal trails will give you more options, from gravel and stepping stones to turf, decomposed granite, or mulch. With budget in mind, make your selection and set your creativity free. Give visitors a secluded niche along your path where they can relax and unwind. Install a decorative garden fence, gazebo, or bench, creating a peaceful retreat. Fragrant flowers planted along the path will add to their enjoyment. Don’t forget to hang some twinkling lights for those moonlit strolls. Boundaries – Determine the width and length of your path and mark it off. Clear– Remove all grass and debris. Put down landscape material. Level – Put down a layer of sand and level it out. Position – Decide if you want the stones in a random placement or a checkerboard pattern. Press – Stones should be pushed into the sand and leveled. Fill – Add gravel, mulch, or planting soil to grow ground covers like Scotch moss. Your wonderful landscape reflects all your hard work and love of gardening. Help others enjoy the fruits of your labor by tying it all together with a relaxing stepping stone path. Lead them on a relaxing journey around your property to discover the wonders Nature has to offer. You’ll surely have a number of repeat guests. From wheelbarrows and shovels to saws and drills, our expert staff is always on hand to help you find the right equipment for your next DIY landscape project. Now that you have your garden path planned out, are you ready for Spring planting? 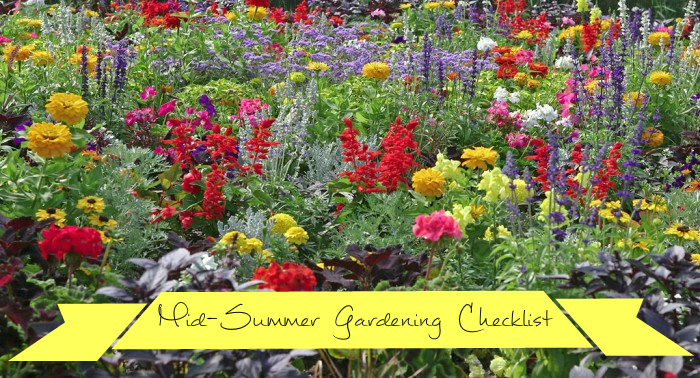 Our blog, Get Started on Your Spring Gardening To-do List, may have the ideas you need. As always, if you have any questions about what to choose, pricing or how-to’s, don’t hesitate to contact us. Stop by our store — we’re open seven days a week. Dreaming of tropical vacations? Those lazy warm weather days don’t have to be a figment of your imagination any longer. Install a hammock in your backyard and get ready to relax. Custom hammocks like the ones made at Pawleys Island Hammock Shop on Pawleys Island, South Carolina conjure images of white sandy beaches and fruity drinks sporting umbrellas. Capture the feel of the tropics right in your own backyard by installing one of these lazy day body slings. No matter which hammock you choose, it’s a simple weekend project with big benefits. How deep of a hole can I dig? – If the ground is full of tree roots or rocks, you might collapse from exhaustion before you dig deep enough to properly plant the posts. Or, you’ll need special equipment. Do I really need that shade? – Some trees drop lots of leaves so you may not want your spot directly under a tree. Where is the most relaxing location? – Avoid the tendency to put the hammock next to a pool or other gathering spots. Look for a secluded area. Measure the hammock lying flat from ring to ring, then add an additional 24 inches. This will tell you how far apart to position the posts. Dig the holes 8-12 inches in diameter and at least 24 inches deep (30 inches if your soil is sandy or loose). Putting the hardware on first before planting the posts in the ground is much easier. Decide how high off the ground you’d like your hammock. Installation instructions should have precise measurements on where to place the hardware. Measuring down from the top of the posts, drill holes and install the hook screws by hand (tighten with a screw driver inserted through the eye to give a better grip). Pour 6 inches of gravel in the bottom of each hole. 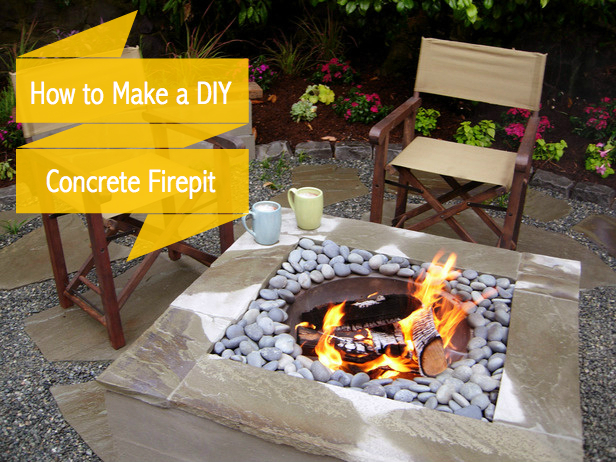 Mix up your bag of quick set concrete. Place a post in each hole with hardware facing the opposite pole. Use a level to make sure the posts are plumb. Pour the concrete around each post and allow 24 hours to dry. Attach the hammock to hook screws. Warmer weather is almost here, and now you are ready for it. Clip in your hammock, close your eyes, picture a peaceful island oasis, and let the rocking lull you to sleep. Sometimes the simplest breaks are the best vacations. Yard work can wait another day! From augers and shovels to concrete mixers and drills, our expert staff is always on hand to help you find the right equipment for your next DIY backyard project. Want to create an even more elaborate backyard retreat? Find your Zen by adding a soothing water feature. Our blog, How to Build a Backyard Pond in 10 Simple Steps may inspire you. As always, if you have any questions about what to choose, pricing or how-to’s, don’t hesitate to contact us. Stop by our store — we’re open seven days a week. Every year at tax time you promise to be better organized. We’re here to help you make that resolution a reality. Getting ready for the tax deadline (April 18 this year) isn’t about rounding up receipts and files. It’s about embracing a different way to approach the piles of paperwork we all have. Creating a well-organized home office is the first step in eliminating the clutter from our lives. Items to Shred – Junk mail or papers containing personal info. Items to File – Papers to keep for taxes or that relate to your house or car. Items to Review – Papers that need a response like bills to be paid. Once you get your papers under control, think about how you use your office. Often the layout can promote clutter build-up as soon as it is cleared. Establish work zones – desk, files, supplies, and electronics. Give items a specific place where they are kept. Clear your desk – Keep only what you use regularly on it. Box it up – Storage boxes and stackable trays keep supplies and files out of sight until needed. Build shelves – Organize materials up and away from desk with containers that are clearly labeled. Think peg board – Mount it on the wall to hold pockets and containers for supplies and papers. Invest in a label maker – Keep files and bins clearly marked for easy retrieval. Use a fold down desk – If your office is in an open area, a fold down desk will allow you to shut it away from sight. 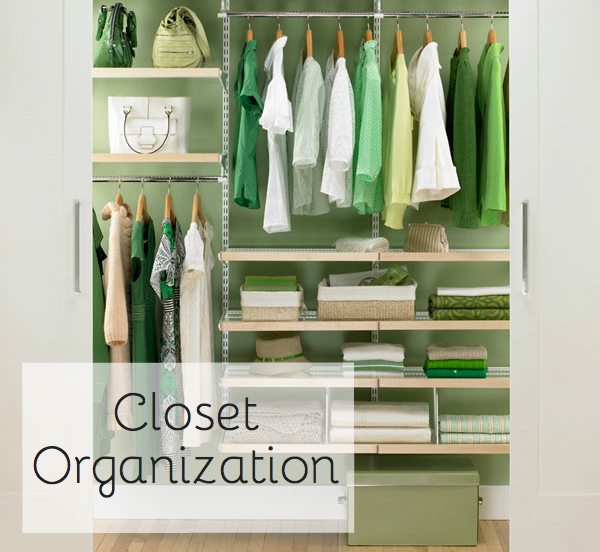 Closet it away – Convert a small closet into a supply/ storage area. Hide printers and other electronics in there. Build a mail center – Stop clutter as soon as it arrives. Hang files as you enter the room to sort mail into. Place a trash can, shredder, and recycle bin close by. Go through each hanging file weekly. Paint – Brightly colored walls energize an office and help stimulate your creative juices. Coordinate your filing cabinets with a new fun color. Think about revising your filing system. By going green and keeping copies of your bills and important papers electronically, you eliminate the hassle of filing papers. You will still need to back up your computer files monthly, to a separate hard drive for security or possibly to a cloud storage. Get in the habit of putting all tax papers in an ongoing file bin as they come in. You will only have to sort through them when you are ready to begin tax preparation. Designate an area in your office for tax file storage, either in its own filing drawer or a hanging file box. Say goodbye to those endless searches for lost tax forms! A fully functioning office saves you time and money. Reorganizing your home office will keep you prepared for tax time and make April another glorious spring month on the calendar. From drills and circular saws to nail guns and belt sanders, our expert staff is always on hand to help you find the right equipment to reorganize and redesign your home office. Want to build some unique shelves for your office? 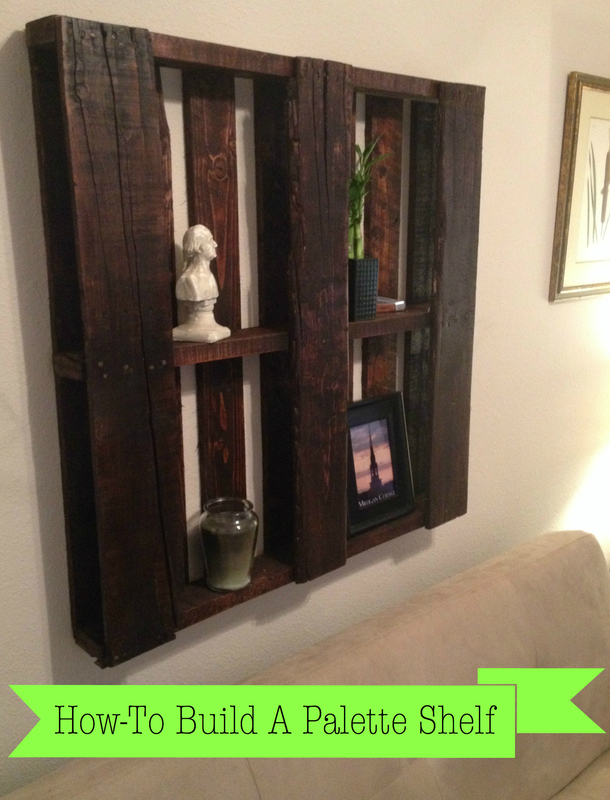 Here is a project from our blog, How to Make a DIY Wood Palette Shelf in 5 Easy Steps,that you may want to try. As always, if you have any questions about what to choose, pricing or how-to’s, don’t hesitate to contact us. Stop by our store — we’re open seven days a week. One of the most popular remodeling projects is renovating the kitchen, a project that can also easily become the most expensive. Forbes magazine lists the average kitchen makeover budget at close to $54,000. Wow, good thing we’re into home DIY projects! 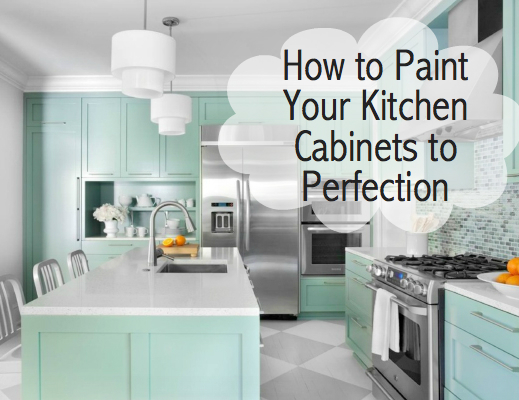 Let’s look at ways to invigorate your kitchen for less. Think about why you are remodeling. Are you updating the kitchen to resell your home? Or are you looking for a change? Answering these questions can help you establish a realistic plan and avoid the expensive pitfalls of kitchen renovations. Determine which projects you want to do yourself and which ones you want to leave to the professionals. If you just want to freshen up the look of the most popular room in the house, what in your kitchen stays – the cabinets, the countertops or the appliances? If you want all new stainless steel appliances, then start your budget there and build on that. Decide what you want done the most and what you can exclude. Determined to have granite installed in your kitchen? Expect to spend 10-15% of your overall kitchen remodel budget just on the countertops. Granite, marble and engineered stones are popular. They do come at a price. Solid Surfaces (Corian, Wilsonart, Avonart) – Stain and bacteria resistant; not heat tolerant. Paint laminate surfaces – Be sure to cover your paint choice with several protective coatings of polyurethane (matte or high gloss finish). Tile – Mix it up. Select different types of tile for the countertop and the backsplash. Wood – Re-purpose old wood doors. 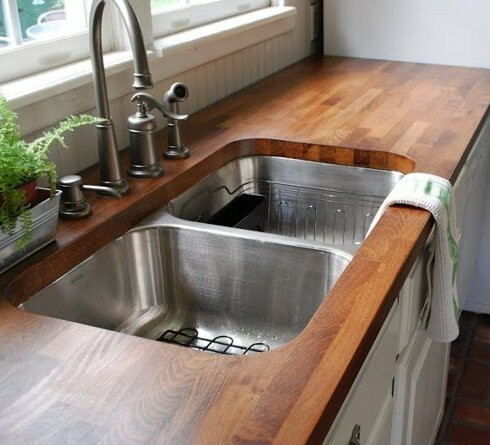 Use old countertops as a template to cut out the wood. Sand, stain and coat them with polyurethane. Concrete – Apply it right over your old surfaces or buy it in slabs built to your exact measurements. Stainless Steel – To get a seamless countertop, order materials cut to specific measurements. Many of these countertop options require 24 hrs. drying time between coats, so be patient. Good things come to those who wait (and do it themselves). You can have the dream kitchen you want by rolling up your sleeves and creatively re-inventing an old space. By saving money and redoing the countertops yourself, you can use the extra cash to buy new appliances or redo the cabinets and floors. Even grilled cheese sandwiches will taste better made in your newly remodeled kitchen! As Emeril Lagasse says, “Bam!” – what a kitchen. From orbital sanders and drills to concrete mixers and paint sprayers, our expert staff is always on hand to help you find the right equipment for kitchen remodels and more. Learn more tips from our blog, Install a Tile Backsplash in Your Kitchen for a Fresh New Look. As always, if you have any questions about what to choose, pricing or how-to’s, don’t hesitate to contact us. Stop by our store — we’re open seven days a week. With the weather getting cooler, the first fall frost won’t be far behind. Your lawn is slowing its growth and your pool is likely doing nothing but collecting leaves. Winterizing your pool and sprinkler system should be at the top of your to-do list. To insure that you have removed all the water from your pipes, blowing out the lines is the most effective. Determine what type of lines you have – black polyethylene pipes or white PVC piping. The type line you have will determine how much pressure you can use to remove the water. Polyethylene pipes can withstand up to 50 PSI (pounds per square inch) while PVC can take up to 80 PSI. You will need to check your air compressor’s rating before you start. Too much pressure in your lines and you can seriously damage your pipes and valves. Connect the air compressor to the mainline just after the backflow device. Always keep at least one control valve open to avoid damaging the system. Start with the furthest sprinkler location and blow-out each line. Be careful of flying debris coming out of your lines. Wear safety goggles and keep clear of the valve during a blowout. Besides blowing out the lines, make sure you protect any equipment that may be exposed to the elements. The backflow prevention device is usually located outside near the foundation. The “bonnet” and “poppet assembly” inside this device can freeze and burst, causing costly damage. Wrap it with insulation and cover with a plastic bag. Duct tape the bag shut to keep out moisture. Don’t forget to address your automated controller. Put it into “rain” mode, which will allow the timer to continue to run (saving your programmed settings) but shut off all the valves. If your controller connects to a pump, you may want to disconnect the power to it. You will lose your settings but the pump motor will not burn out from continuous use. Winterizing your pool is a definite must-do. Clean all the debris from around and out of the pool. It’s important to leave water in your pool. Without the weight of the water, frozen ground can expand and cause a pool to rise up, cracking it. Lower the water level just below the mouth of your skimmer. Make sure the water chemistry is balanced to protect against staining and etching. Add a winterizing chemical kit to the water to keep it clear of algae. 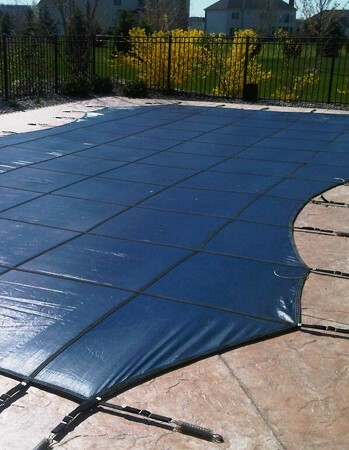 Cover the pool to keep out debris, inspecting the cover for any tears. To keep water off of the cover (and children safe), you may want to invest in an automated pump. Store all of your pool equipment (ladders and slides) to protect them from harmful weather damage. As with your irrigation system, you need to drain all plumbing lines associated with your pool. After blowing the water out of the pipes, seal the line on the pool end to keep water from getting back into it. Many pools come with plugs specifically for winterization. Don’t forget about your filter. There is a plug at the bottom that will allow water to drain out. Open the air relief valve if you have one. Put the multiport valve in the “closed” position and remove the pressure gauge. Cover any exposed equipment with insulation and a plastic bag to keep moisture out. Winterizing your pool and irrigation system keeps you from experiencing the headaches of ruptured water pipes and costly repairs. While ice sculptures created by a burst pipe might appear beautiful, your wallet will not think it is so spectacular. Save your money for more important things like suntan lotion and a new pair of shades. Our expert staff is always on hand to help you with your DIY winterizing projects. From leaf blowers and wet/dry vacuums to air compressors, if you have any questions about what to choose, pricing or how-to’s, don’t hesitate to contact us. Stop by our store — we’re open seven days a week. Are your trees healthy? Even though fall is typically not the season to prune your trees, which encourages growth or flowering next spring (this is usually done after the coldest winter weather has passed), it is a perfect time to assess the health of the trees on your property. Removing dead limbs won’t encourage growth, and will help eliminate potential problems brought on by inclement weather. It will also provide you with ample mulch and firewood for the long cold months ahead. Look for tree hazards by scanning the tree from top to bottom. Use binoculars if needed and check how vigorously the tree is growing. Compare its growth to others around it. Vigor is reflected in the amount of leaf cover, leaf size, color and condition. If the tree seems to be thinning or experiencing stunted growth, then it may not be flourishing as robustly as it should. How Does the Trunk Look? Continue your examination down the trunk of the tree. Look for forked trunks, which indicate potential weaknesses. Signs of decay may also be evident. These present themselves as cavities, cankers or conks (fruiting bodies of fungi) on the trunk itself. Finally, check root zone of the tree. Look for mushrooms and other fungi that might be growing around the base of the tree. This is a sign the tree roots may be decaying. Construction and trenching are often causes of root damage, so protect your trees when work is done near them. Pruning dead limbs is necessary to keep you and your property safe and it needs to be done properly. Make clean cuts with sharpened tools. Look for the “collar” or swollen tree flesh that develops where the dead limb joins the healthy section of tree. This is the tree’s natural defense system. Make your cut using a pruner or a chain saw just outside the collar, leaving as little stub as possible. Do not remove the collar because it is needed to fight any remaining disease. Once you have examined your trees and removed the dead limbs, recycle the debris into mulch or firewood. Using a wood chipper, you can make easy work of breaking it all down. The size of the tree limbs determines the size of the chipper you will need. You can mix grass clippings in with your grind or even run the mixture through the chipper twice to get a finer mix. 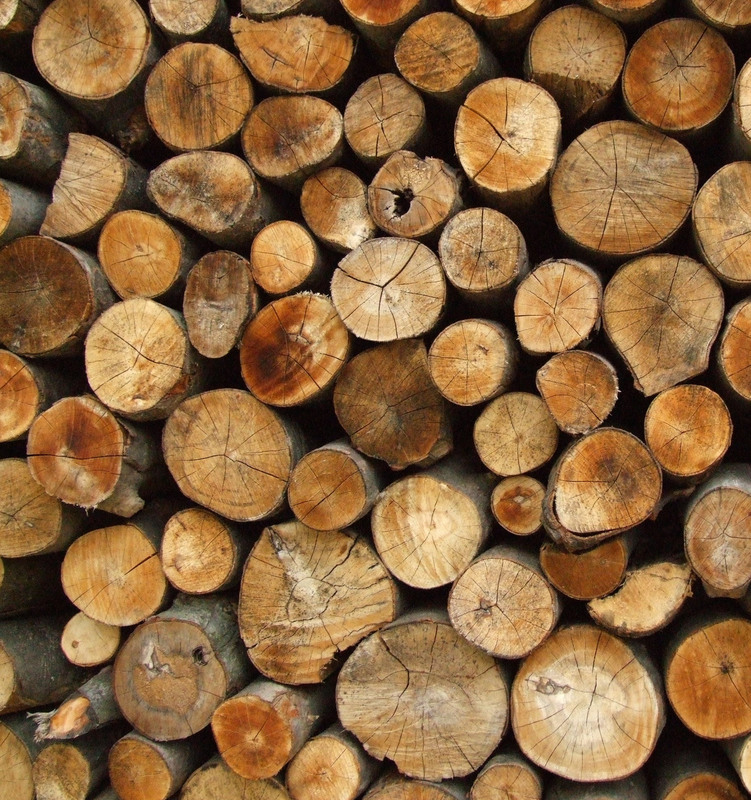 For larger tree limbs or stumps use a log splitter to cut the debris down to a usable size for the fireplace. Food for thought – if a dead or dying tree does not pose a hazard to people or property – why not leave it as part of your landscape? “Snags” or wildlife trees are excellent habitats for a variety of species of animals. Birds and small mammals use snags for nests or storage areas. Woodpeckers feed off the insects in them and hawks use them as perches for hunting. Snags can also be created from living trees. An arborist would be able to help you select a good candidate for a snag in your yard. Snags provide hours of wildlife watching. Our expert staff is always on hand to help you with all of your landscape projects. Check out some of our blog posts on how to remove a dead tree for more information on tree cutting, as well as a list of tools you might want to use in getting rid of tree limbs and trunks. If you have any other questions about what to choose, pricing or how-to’s, don’t hesitate to contact us. Stop by our store — we’re open seven days a week. Perfecting the art of cutting tile is essential for any self-respecting do-it-yourselfer. You may want to tile a floor, a shower, a backsplash or an accent for any room in your home. Chances are, you’ll be cutting tile to fit around the room, to accommodate the faucet or cabinets and to customize a personal creation. 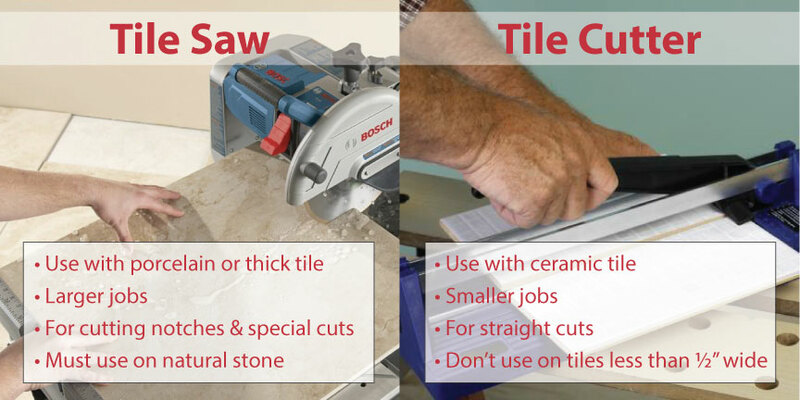 We’ll discuss how to cut tile using a tile cutter and a tile saw. A tile cutter needs to be wider than the tiles. Measure the size based on making a diagonal cut from corner to corner. Make sure the tile cutter has a rotating guide for making cuts at different angles. Practice cuts using scrap tiles first. Buy enough tile to accommodate waste, whether you’re using a tile cutter or saw. Mark the glazed tile surface using a pencil, making a tick where a cut begins and ends. Adjust the guide on a tile saw for the correct measurement. Slide the lever on the tile cutter so the blade is closest to you. Place the tile glaze side up on the cutter or the saw, making sure the tile sits snug against the stop or guide. Score a tile by moving the cutter lever so the steel wheel is on the tick mark at the edge of the tile, then pushing down on the lever and dragging the wheel across the tile with even pressure. Then push down on the lever and apply pressure to both sides of the score line, and snap the tile in two. For a saw cut, turn the saw on, move the tile gently into the blade and let the blade to all the work cutting the tile. For L-shaped notches, use a tile cutter to score both sides of the tile, and tile nippers to snap along one of the lines and hope the piece breaks cleanly along the second line. If not, that’s why you’ll have more tile than you need, for mistakes. Use a sharpening stone to smooth out the cut edge of a tile, unless it will be hidden under molding. To learn more about the aesthetics of installing tile, read our two blogs: Install a Tile Backsplash in Your Kitchen for a Fresh New Look and The 4 Secrets to Beautiful Tile Accents in Your Home. Our expert staff is always on hand to help you with renovating your bathroom or kitchen. From tile cutters to tile saws, if you have any questions about what to choose, pricing or how-tos, don’t hesitate to contact us. Stop by our store — we’re open seven days a week. It’s pretty incredible the amount of things you can make out of a wooden palette, one of which being a wood palette shelf. Since shabby-chic and rustic charm are two popular trends lately, this could be an ideal project for you. Not only is it inexpensive, but it is functional and makes for a unique addition to your home. Simply gather a few materials and follow the five steps below and you’ll have a wood palette shelf all your own! Sand your palette to satisfaction. First, sand your palette down to remove any chalk lines and create a nice smooth finish for a more even stain. This is where you’ll use both sanders, depending on which part of the palette you are sanding down. The micro belt sander gets between slats and in smaller spaces better, and the vibrating sander can smooth out the top surface. Liberally apply your stain. Once you’re satisfied with the sanding job — accomplishing a shabby-chic appearance — it’s time to apply the stain. This can be as liberal as you want. For a darker stain, apply as much as you want until you’re happy with it. Let the palette dry a while. Then, leave the palette be for about 15 hours so that all the stain is dry. Preferably outside if possible, otherwise it’ll really stink up a room. Spray on a few clear coats. After your palette is entirely dry, spray on the clear adhesive spray to seal in the stain and color. Two full coats are recommended. Hang your new creation. Lastly, get out your drywall screws and drill. Line up where you want your new wall feature and screw it into place (preferably into studs). Our expert staff is always on hand to help you plan your next DIY project. From palette shelves to repurposed coffee bars, if you have any questions about what to choose, pricing or how-tos, don’t hesitate to contact us. Stop by our store — we’re open seven days a week. One of the pleasures of summer living is enjoying a homegrown bowl of salad greens and vegetables harvested from your garden. Not only are these meals super fresh and bursting with flavor, harvesting your garden is one of the ways to keep it healthy. In addition to watering, weeding, mulching and composting, home gardeners need to tend to their patches of produce and petals all season long. Below are three more ideas to keep your gardens thriving. As the summer heats up, cool-season salad vegetables such as lettuce, spinach and Swiss chard grow stalky and bitter as they go to seed. Pull them out, pitch them unto the compost pile, and replant the area with quick-growing, warm-season veggies and herbs like loose leaf and oak leaf lettuce, red romaine, beans, summer squash, basil or rosemary. Strawberries, blueberries and raspberries are not only nature’s candy for people, but critters love them as well. As your plants bear fruit, covering them with bird netting or synthetic fabric row covers will protect from a raccoon’s midnight raid or a bird’s early morning breakfast. Another possible deterrent from birds stealing your harvest is stringing Mylar flash tape over and around your garden. Climbing roses, clematis, even string beans and hops produce new growth faster in the summer and will benefit from the help of an arbor, trellis or garden stake. Secure plants loosely with any soft or flexible material such as hook-and-loop plant ties or garden tape, allowing for expansion. Avoid using twist ties with wire centers, which can rust and cut into plants over time. Our expert staff is always on hand to help you plan your next gardening project. From landscaping tools to garden tillers, if you have any questions about what to choose, pricing or how-tos, don’t hesitate to contact us. Stop by our store — we’re open seven days a week. 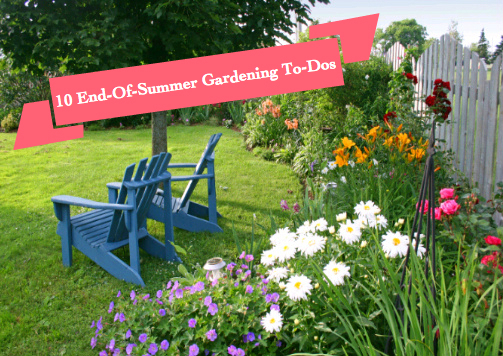 The long days of summer are just right for getting all those garden improvement projects underway. Along with abundant sun and warmer weather, new plants have a chance to establish root systems and thrive during summer months… just like people tend to do, enjoying a tall glass of lemonade (granted, plants prefer a cool drink of water). Although you may have a fabulous garden already, there are so many ideas for expanding it, or creating designated areas for entertaining or relaxing. This time of year is perfect for enjoying the outdoors, so make your backyard oasis your own. All it takes is a little hard work and a passion for making your garden vision a reality. 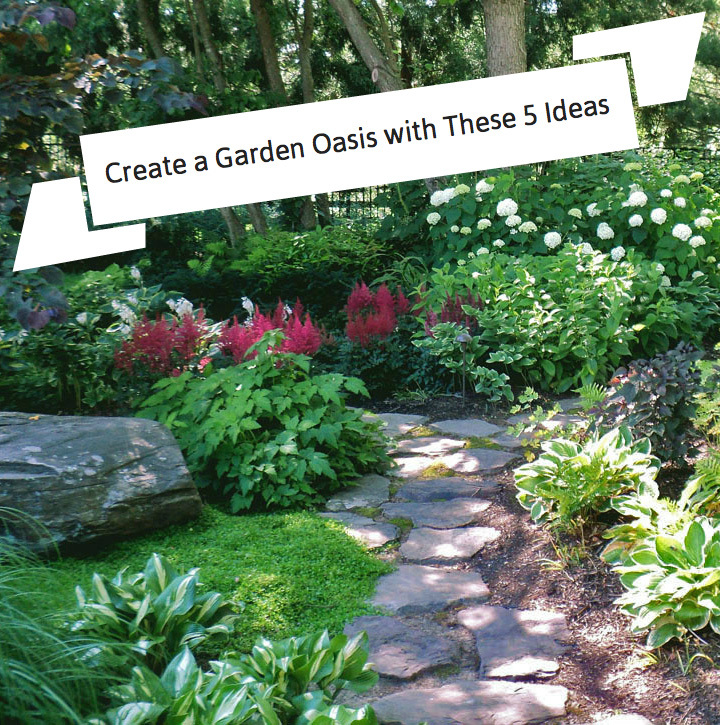 Below are five ideas for sprucing up your garden. Almost any yard or garden has shady areas. Don’t let them go to waste! From hydrangeas to hostas to hardy fuchsias, fill those dark areas with shade-loving perennials or shrubs and see it come to life with beautiful greens, gentle lavenders, stunning blues and pinks with some showy flowers for good measure. Aquatic plants such as water lilies and lotus add depth and breadth to any water feature, especially those located in a sunny spot. Fill two-thirds of a 12-inch diameter pot with garden soil (do not use potting mix). Then place the roots of one plant into the center of the pot. Cover with two to three more inches of soil, and add a light pea gravel covering. Place the entire potted plant in at least 12 to 18 inches of water, and watch them flower. Succulents such as hens-and-chicks, aloe and sedum are low-maintenance, drought-tolerant sun-lovers that will grow anywhere, from pots to cracks in a stone wall, even in the shade. With so many varieties in striking shapes, colors and blooms, succulents also provide visual interest in nearly any type of garden. Protect succulents from extreme cold and don’t over-water, otherwise, they are easy to maintain, keeping your garden lush. Hardy herbs such as rosemary and thyme not only flower in the summer, but also add intoxicating fragrance, especially when planted along a garden path. Group the herbs with a sprinkling of Alyssum in white or purple to intensify the sweet smell (especially after a summer rain). Plus, with a little judicious clipping, you can enjoy an herb-filled marinade or dressing for all that summer grilling you plan on doing! Our expert staff is always on hand to help you plan your next landscaping project. From landscaping tools to tree spades, if you have any questions about what to choose, pricing or how-tos, don’t hesitate to contact us. Stop by our store — we’re open seven days a week. 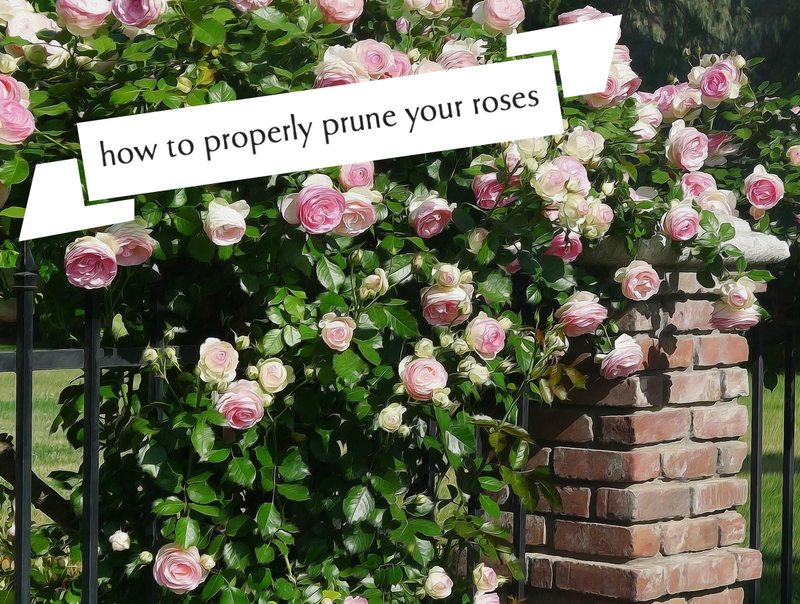 For Healthier, Stunning Roses, Prune, Prune, Prune! Most flowering trees and shrubs benefit from annual pruning, especially roses. Not only does pruning rid the plant of dead and diseased wood, it encourages new growth and gives it a nice shape — one that promotes beautiful blooms. With a few tools such as pruners, long-handled loppers, shears and thick gloves, a gardener can cut and shape to their heart’s delight! 2. If the plant blooms on last year’s canes, prune after flowering. Most rose gardeners are interested in removing dead, damaged or diseased branches from their plant to promote the growth of large, full flowers that are pleasing to the eye. Prune out crossing branches, all branches smaller than a pencil in diameter and even extra long canes, which prevents the roots from being loosened by strong winds or freeze/thaw cycles. Pruning is also an opportunity to correct any problems with the plant’s overall form or reduce the overall size of a plant in relation to the rest of your garden. For most rose bushes, leaving six to eight strong, healthy canes will produce a full, nicely shaped plant. Deadheading, a form of pruning to remove spent blooms, prevents the formation of rose hips or seedpods and encourages new, attractive blooms (although rose hip cultivation can be advantageous for home chefs who make rose hip jelly and tea drinkers who enjoy a cup of rose hip tea). Our expert staff is always on hand to help you plan your next landscaping project. If you have any questions about what to choose, pricing or how-tos, don’t hesitate to contact us. Stop by our store — we’re open seven days a week. Summer is the perfect time to have friends and family over for outdoor entertaining and parties. So why not pull out all the stops this year and cover your bases with this in-depth event planning guide. Not only does this involve prepping your yard, but event equipment and unique DIY inspirations can make your home the perfect spot for relaxing and entertaining this summer. We hope you can take a few ideas and best practice tips from this infographic, and as always, let us know if you have questions about the equipment, steps or other specifics. Happy outdoor party planning! Especially if your lawn turf was planted years ago, re-planting with today’s improved grass varieties can help your mature lawn resist disease and insect damage, making it stronger and more adaptable to the changing conditions of your yard due to landscaping, sun and shade. One of the best ways to make dramatic improvements to your lawn in short order is by slice or slit seeding. Conventional and over-seeding are great for helping to thicken an existing lawn. 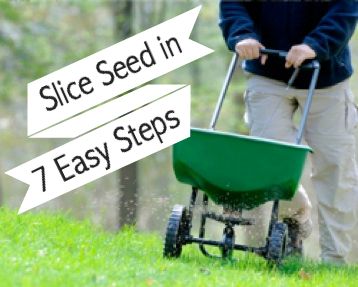 Use slice seeding to make direct contact with the soil for the seed to germinate quickly. The technique literally slices into the soil, creating rows for the seed to fall into, all in one motion. Step 1: Prepare your yard. Slice seeding is designed to work on the existing turf and soil. Remove any large rocks or debris from the area and mow the lawn to about 1-inch in height, which gives new seedlings the best start. Step 2: Determine the condition of your lawn. If the thatch is too thick to establish new seed, use an aerator to reduce the layer before seeding. This allows the equipment to slice easily through the thatch and into the soil. Step 3: Crank up the seeder. The slice seeder cuts vertically through the grass and thatch, into the soil, dropping seed in the rows cut behind. Run the slice seeder over the entire area to be seeded. Step 4: Add a starter fertilizer. A good fertilizer with slow release nutrients will feed the new seedlings and help develop the plant and its roots. Step 5: Water, water and water some more. New grass requires gentle watering frequently for short periods of time. For the first 3 to 3 1/2 weeks, do “light, frequent” watering three times a day (morning, noon and evening) for approximately 10 – 15 minutes, while establishing plants. Use a sprinkler system or a water hose that comes closest to natural rainfall, to avoid washing seed away from the soil surface. After your turf grass is established, switch to “heavy, infrequent” watering one or two times a week to a depth of 4 to 6 inches, which takes around 45 minutes. Consider using automatic timers to make watering easy. Step 6: Stay off the grass. Avoiddislodging the shallow roots of new seedlings, which stops any new growth completely. Do not walk on new grass and keep dogs and other animals away too. It’s a good idea to cordon off any sections of lawn that were slice seeded until it matures. Step 7: Mow when the height is right. Wait until new grass blades are 2.5 to 3 inches high before making your first cut. When the blades reach around 4 inches, mow back to three inches; avoid removing more than 1/3 of the total blade length. Only mow as your lawn grows, which could mean every four or five days in the spring. If the lawn dries out stop mowing all together, until adequate moisture returns. Our expert staff is always on hand to help you plan your next lawn and landscaping project. If you have any questions about what to choose, pricing or how-tos, don’t hesitate to contact us. Stop by our store – we’re open seven days a week. We’d love to help give your lawn an upgrade! Who wouldn’t enjoy a barefoot walk through a lush, green lawn? Grass is arguably the most popular groundcover for homeowners who appreciate its excellent ground protection and desirable curb appeal. For those DIY-ers who also enjoy caring for their lawns, dethatching should definitely be on the to-do list. Dethatching rids your lawn of too much thatch and can be done with a dethatching rake or a dethatcher, a mechanical gardening tool that rolls over the grass and thins out thatch with rotary blades, tines or prongs. If a lawn has a springy feel underfoot, then often that means it has a too-thick thatch layer. Measure thatch for that ¾-inch cut-off by removing a small, three-inch layer of grass and soil or just pry up a small section of turf. Look at your lawn. Is soil visible between turf crowns? Can you touch the soil through the visible thatch layer? If not, it’s probably too tough and needs to be thinned. Certain grasses tend to form thicker thatch layers and do so quickly, such as St. Augustine grass, Bermuda grass, Zoysia grass, Bent grass and aggressive Kentucky bluegrass varieties. Also, dethatching is best done at the height of the grass’s growing season. Since warm and cool season grasses grow most vigorously at different times during the year, know what kind of grass your lawn is before dethatching. Choose a cooler day to dethatch when grass is actively growing and the soil is moist, not dry. After dethatching, the grass usually needs 45 days to grow back fully. If your area is experiencing a drought, watering restrictions or intense heat waves, postpone dethatching until it passes. Outdoor lighting for your home and yard is not only a practical design feature that keeps stairways, porches, patios and driveways bright during dark hours, but it adds style to your home’s exterior appearance. However, malfunctioning lights can signal neglect to neighbors and passersby, putting your property in potential danger. 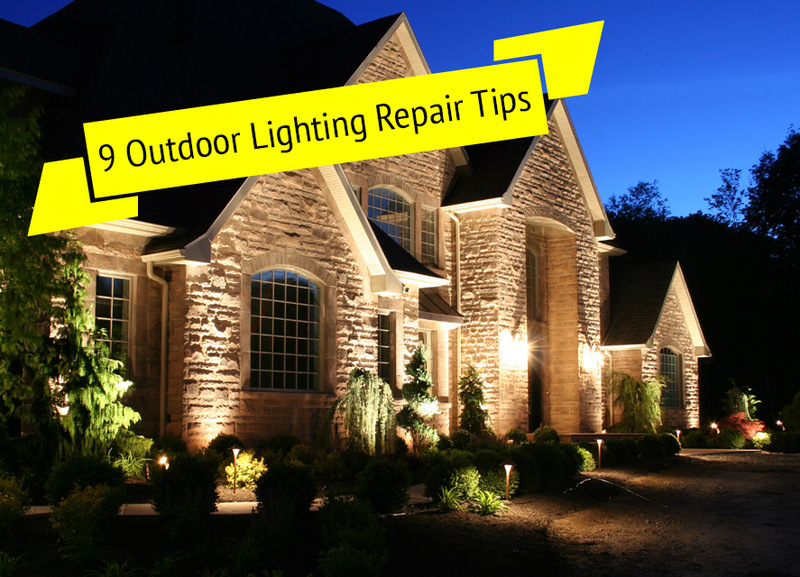 Luckily for homeowners, a few easy do-it-yourself steps are all you need to keep outdoor lights working correctly. So, get out the ladder and let’s begin! Diagnosing and repairing challenging problems with outdoor lights or an exterior lighting system is a challenge best left to a professional. Any electrical system – and the repairs made to them –must comply with specific electrical codes, which needs expert experience. Find a professional whose electrical experience includes exterior lighting and can resolve issues specific to outdoor systems such as voltage and corrosion. Make a Great First Impression. 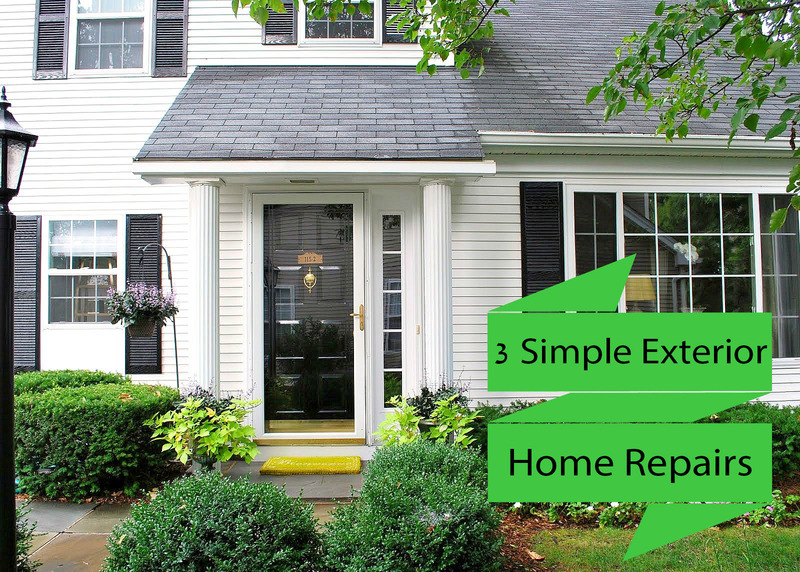 Cleaning your exterior doors and windows is a sure-fire way to get your house noticed. Add a paint job for the trim and you’re well on the way to that oh-so-desirable curb appeal, transforming a nice-looking house into a beautiful home your visitors will admire. It’s surprisingly effective to clean doors and windows with a few readily available tools. Use a good ladder to reach high windows, taking care to observe safety first. Step 1: Lightly soap up a strip applicator, a handheld sponge or hog-bristle brush with a little dishwashing liquid and water, then clean dirt and grime off without scratching the glass. Step 2: Wipe the window clean with a squeegee that’s sized appropriately for the pane. Simply pull it over the window in one direction, wiping off the squeegee blade with a lint-free rag at the end of each stroke. Step 3: Use a damp, wrung-dry soft rag, like a chamois, to dry off corners and any place the squeegee won’t reach, without leaving streaks. Clean Window Tip: Get rid of stubborn mineral stains without scratching the glass by gently rubbing them with fine 000 steel wool or a cleansing powder that contains oxalic acid (such as Zud or Barkeeper’s Friend). Step 1: Mix equal parts water and vinegar, or the same dishwashing liquid you use on the windows in a spray bottle. Start by spraying the entire doorframe — top and all — then wipe the frame with a soft cloth to remove dirt, dust and fingerprints. Continue by spraying the door itself and wiping dirt and grime away with a clean cloth. Thoroughly dry the door to prevent any water damage after cleaning. Step 2: Clean the door’s windows or a complete glass door the same way you would clean the exterior windows, using appropriately-sized tools. If you’re cleaning a sliding glass door, remember to vacuum the tracks and wipe them clean with a little multi-purpose cleaning spray and a dry cloth. Step 3: Clean locks, handles, kick plates and other hardware by applying a brass or steel polish with a soft cloth, then wiping the hardware dry with a clean rag. Clean Door Tip: Clean tough grease and stains without damaging the door by applying mineral spirits to a cloth or sponge, then using it to scrub away the stains on the door, wiping the surface clean with a rag. If your exterior trim could use a fresh coat of paint, consider using an airless paint sprayer. This tool comes with a variety of features to help you achieve a crisp, clean, painted finish, without the effort of using a roller or a brush. Easy, Economical, Quick and Versatile. Once you clean and tape around the trim to be painted — to protect other painted surfaces — the accuracy of an airless sprayer lets you paint up to four times faster than rolling or brushing, which means you can be done with your trim job in a jiffy! And you’ll also get an even coat of paint on the trim. Our expert staff is always on hand to help you plan your next DIY dream. If you have any questions about what to choose, pricing or how-tos, don’t hesitate to contact us. Stop by our store – we’re open seven days a week. We’d love to help you make your home be a stand-out on your block! Spring has sprung! Lately it’s been the perfect weather for beautifying your lawn and garden, so if you haven’t already started doing so, you may want to consider putting on your gardening gloves, breaking out your mower and other lawn care equipment and getting to work! To help guide your lawn and garden efforts, the following infographic outlines 11 tips to a gorgeous outdoor space. Use it as a jumping off point, and if you have other ideas for spring lawn and garden tasks, please let us know in the comment section below. And as always, if you have questions about the tools and equipment necessary for your lawn and gardening efforts, don’t hesitate to contact us. Happy green-thumbing! Heidi Hudnall is the current Digital Marketing Manager at Runyon Equipment Rental. She is passionate about blogging, with a sincere desire to help answer questions and provide inspiration for creative DIY-ers and homeowners. Has this spring’s snow melt revealed a mailbox that’s been pummeled by plows? Now’s the time to add a little curb appeal to your home and replace that damaged mailbox with a new version, which not only meets federal regulations, but it’s stylish too. All you need are a few hours and some basic tools to check this outdoor improvement off your spring checklist. Once you’ve checked for underground utilities, you’re ready for the first step. Step 1 – Dig the mailbox posthole using a post hole digger or a shovel, making sure it’s deep enough to set the post at the correct height, allowing for about 6 inches of gravel at the bottom. Step 2 – Add gravel and prepare quick-setting concrete mix according to the manufacturer’s instructions. Step 3 – Set the post and fill the hole with the prepared concrete mix, tamping to eliminate air pockets and sloping around the base to allow for water runoff. Or, you can fill the hole to within a few inches of the top and conceal the concrete with soil after it sets. 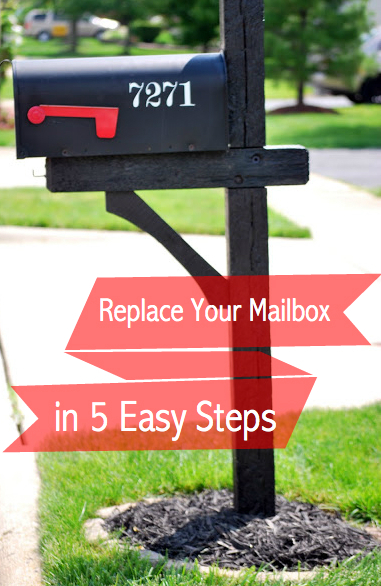 Step 4 – Attach the mailbox to the post after it sets with attachment brackets that come with the new mailbox. Use the old brackets or purchase them separately. Use a level to check the mailbox and adjust as needed. Step 5 – Label the side and the front of the box with your house number using stick-on digits or stencils and paint. While you’re at it, take another step to improve your curb appeal by co-coordinating your mailbox numbers with your house numbers. For more ideas about how to prep your home, yard and garden for warm weather, visit our how-to page. If you have any questions about this process and the tools necessary, be sure to comment below or contact us on our website. Today’s the day for that do-it-yourself concrete repair project you’ve been meaning to accomplish for a while now: restoring your driveway, walkway and patio. The weather’s been cooperating all week long — there’s been no rain and temperatures are ranging between 70° and 75°F — which is not only great for your mood, but perfect for your concrete, which needs to maintain a surface temp of at least 50°F before you can repair those cracks or crumbles successfully. *A quick note about power trowels: available for rent, this equipment comes with accessories for working out surface imperfections and creating a satin smooth concrete finish with ease. As always, let us know what questions you have, or if you need advice on which tools will help you effectively complete a project. Small cracks up to a half-inch wide are the simplest to repair. Use a wire brush or chisel to scrape any debris from the crack, then spray or hose clean with water. A latex concrete patch can be injected with a caulking gun or troweled into the crack, leveled and smoothed out. Tiny cracks up to a quarter of an inch wide should be worked with a chisel to widen slightly, enough to help hold the patch material in place. Spray the crack clean with water and let dry before applying a concrete adhesive, then a concrete patch compound. Level the patch with a trowel. Once any crack is filled, cover the repair with plastic and allow it to dry slowly before moving on to resurfacing. If you plan to resurface your concrete, mask the expansion joints. These are the dividing areas of large slabs that help control cracking. Mask them with duct tape before applying a dressing. Mix the resurfacer with a portable mixer or electric drill fitted with a mixing paddle, pour it onto the clean slab and spread it out immediately with a trowel. Remember to texture the surface with a push broom, to create slip resistance. Time is of the essence. Experts say is takes about one hour to resurface 60 square feet of concrete. If you use a polymer-based cement resurfacer, you’ve got less than 30 minutes to apply once water is mixed in, so prepare it in batches. The treated surface can be walked on after about two hours; wait six hours before driving a car onto a driveway. After 24 hours, protect the new surface with a clear, waterborne masonry sealer. 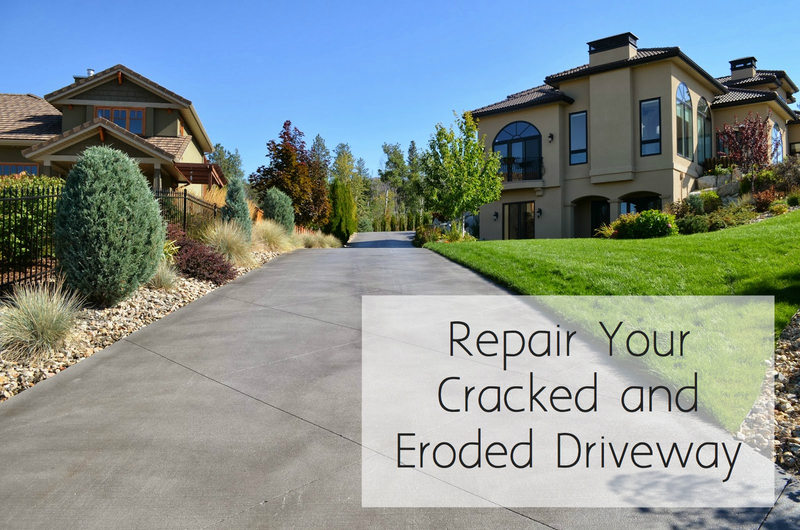 Learn more about restoring cracked and eroded surfaces from our blog post, The 7 Step Process to Restore Your Cracked and Eroded Driveways. Continuing with the spring cleaning trend, this infographic provides you with tips for those pesky indoor and outdoor tasks that need checked off your to-do list. Some of these you may not think about typically, so take a look and identify which may be applicable to your home. And it’s a great idea to get a head start on these now, so by the time summer break, and consequentially summer entertaining, rolls around you’re ready to relax! Let’s make maintaining the pool or hot tub less of a chore this year. These days in fact, automatic pool cleaners are available from your local hardware store. These cleaners (whether vinyl, concrete or fiberglass) can easily remove dirt, twigs, leaves and debris from any in-ground pool or spa. They work with the existing skimmer, pump and filter, and they can save you from the drudgery of vacuuming for years to come. Or, if you prefer to do the maintenance yourself, try these easy tips for keeping your pool or hot tub perfectly crystal-clear. Trim back trees or bushes near your pool or hot tub that can shed pollen, blossoms or leaves onto the surface. Skim the water surface to remove floating debris and empty the skimmer basket. Vacuum slowly across the water, overlapping areas like you would when mowing a lawn. The average pool requires 30 minutes of vacuuming. Use a nylon brush (or a stainless steel brush for concrete) to brush away any algae off the sides. Every three months, drain the hot tub of water. Then, clean thoroughly with a mild cleaner, avoiding anything that’s too abrasive, which can damage the acrylic shell. Remember to clean the hot tub cover too. 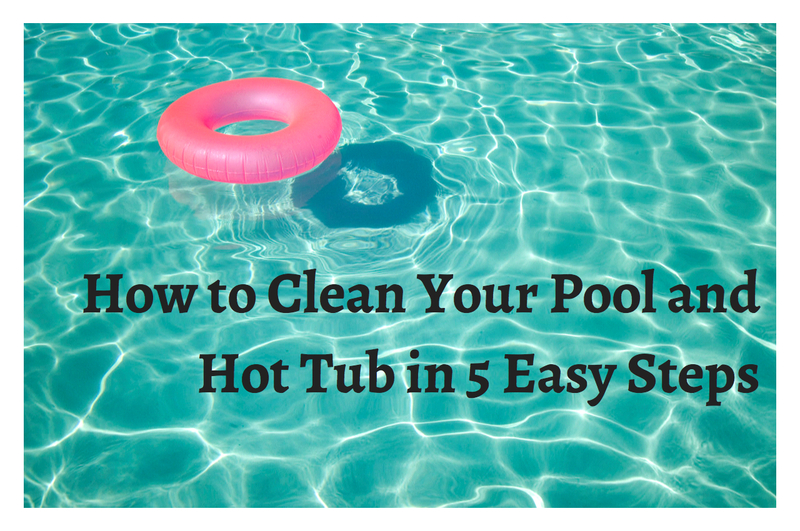 Use a cleaner made for vinyl or a weak chlorine solution and let it air-dry before re-covering the hot tub. The correct chemistry for a pool or hot tub is critical to keeping the water clear and safe. Test the chemicals weekly. Adjust pH first if needed or “shock” the water by dissolving chlorine and/or and alkalinity increaser in a little water, then pour it in. Every week, redirect water flow into the filter by backwashing dirty water into the filter bag or to the storm drain. If the pool has a cartridge-type filter, remove it for rinsing and reinsert. Hot tub filters are cleaned in a similar way. Next, shut the filter system off, close the skimmer valve and clean out the hair/lint catcher of a pool pump. Empty the contents of the basket in the trap and reinsert. Finally, add chlorine to the pool using a floating container, which holds chlorine sticks or a chlorinator (the tube-like tank next to the filter that slowly introduces chlorine into the pool automatically). Use the amount recommended on the packaging. In continuing with this week’s Spring Cleaning theme, I’d like to share some of my current projects to get you thinking about projects you can do around your house. Although it is a holiday weekend, maybe you’d like to knock a few things out before family gets in tomorrow or Sunday. So, take a look at some of my pictures below and get inspired! Again the importance of organization: I’ve been cleaning out my closets and garage, which as you can see are full of shoes! I used to work at a shoe store, hence the exorbitant amount. You can also see some of the boxes and storage bins I’ve started to use though, a key to keeping things in their respective places and all together. We’re moving furniture and getting clean under the beds too. It’s been a month of sheer work, but once summer is here, it’ll be nothing but fun! Give your rooms new life: In addition to organizing, I’ve been redecorating and sprucing up some of our furniture and decor in various rooms. You can see below our bathroom. We’re having a new shower put in and I’m getting ready to paint above the toilet. There used to be a cabinet there and a while back we painted around it, but recently we removed it, so now the wall needs painted. Also, the living room furniture is brand new, bringing a modern chic vibe to the space. The bar chairs we’ve had for a long time; I bought them at a furniture store by Castleton several years ago, so they were a tad dated. To give them a fresh and updated look, I cleaned them up with a new coat of paint and reupholstered the fabric. You can go to the hardware store and get touch up kits for furniture in all colors to get the knicks out and keep it looking new. And remember, now is also the time to take things up a notch and clean ceiling fans, light fixtures and bulk heads. 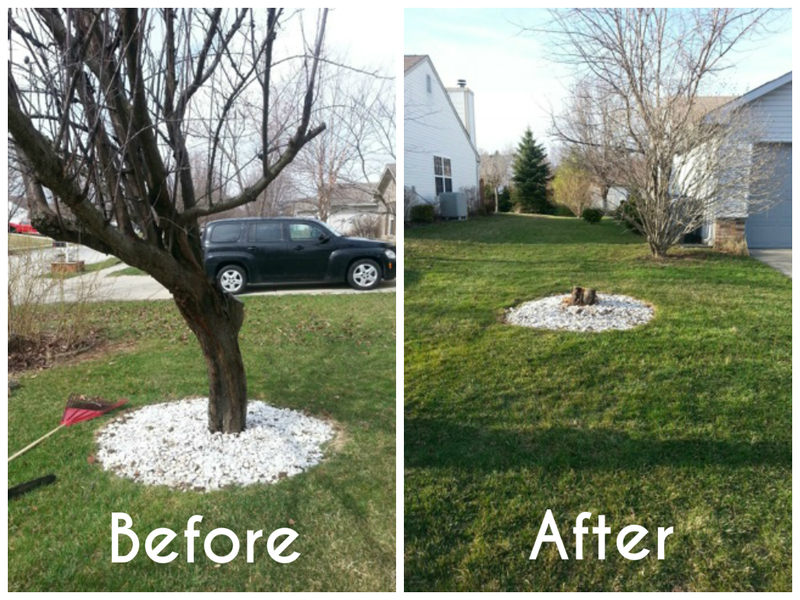 Get your yard in order: Below are before and after pictures of a dead tree we cut down in our front yard. It once added to our curb appeal, but then it started to rot, so time to go! We cut it down with a chainsaw, easy as pie. Now is also the perfect time for planting spring flowers. Poppies can be planted safely in pots. Oh, and another thing, it’s a good time to spray around the exterior of your house so insects cannot make their way in. 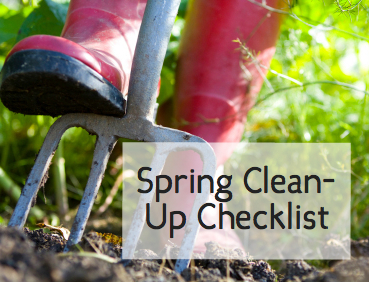 If you need more tips on which yard clean-up tasks should be on your checklist, read this post. 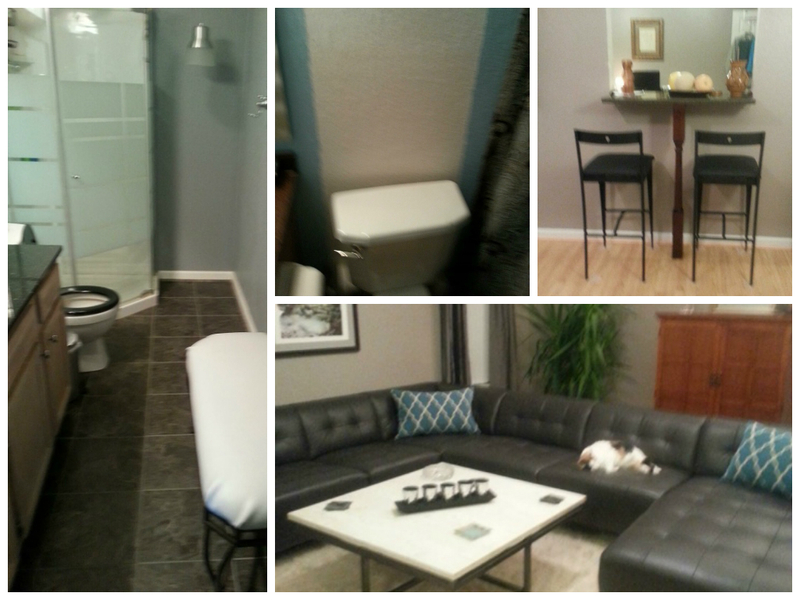 Hopefully this DIY project recap helped give you a few ideas for your home. If you need any advice for which tools to use for your projects, let us know! And please post your own ideas for Spring Projects in the comment section below. For more inspiration, be sure to read the post from earlier this week. It is that time of year again, time to unpack your warm-weather clothes and do some around-the-house Spring Cleaning. So open up your windows, let a little light in and get ready to get dusty! This year’s winter was pretty rough, with an exorbitant amount of snow, ice and slush, all inevitably tracked into your home. Not to mention all the other dirt, grime and mess that has probably built up over the past few months. Well, since sunshine re-energizes us all, channel some of that inner motivation and get to work cleaning and breathing some much-needed life back into your home this spring! Begin your spring cleaning by giving your whole house a touch-up. This means cleaning your toilet, shower and sinks, sweeping, dusting, vacuuming, basically all those fun things you just love to do, eh? Then, if you’re feeling really ambitious, you can go a little more in-depth and wash your windows, clean ceiling fans and light fixtures, etc. Taking the time to wipe away all the grime will literally make your home sparkle, so the result is well worth it. 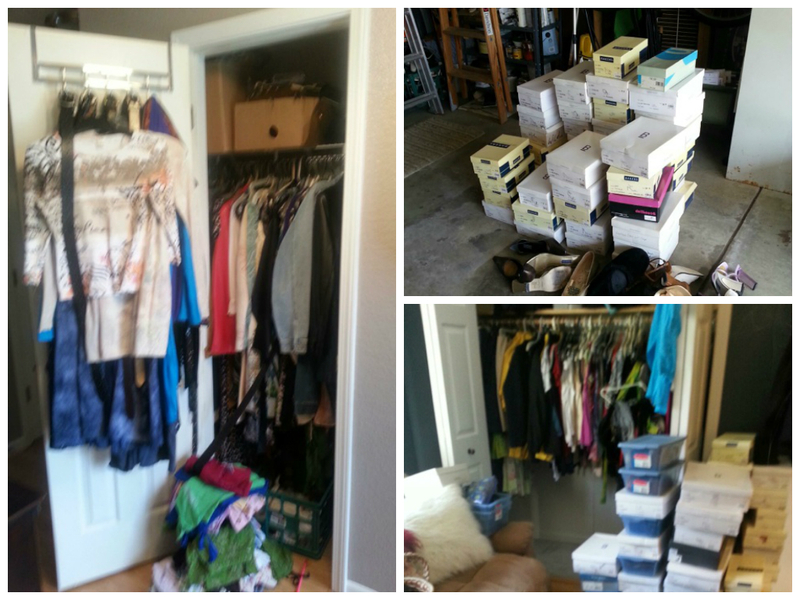 Not sure about you, but sorting and organizing closets is always therapeutic for me. At least once a year it is a good idea to get rid of the old and make room for the new. With the weather finally warming up and the seasons changing, not only does that mean packing up and putting away winter sweaters, boots, scarves, etc., but even better, that means getting out your warm summer outfits! And while you’re doing a wardrobe switch-out, you might as well reorganize wayward boxes, files, and all sorts of other things that have most likely accumulated. File folders, storage crates and designated boxes really help with this I’ve found. Everything has a home as I like to say, so make a place for things and it will be much easier to find what you’re looking for later on. As briefly mentioned already, winter probably did a number on your carpets, so now is a good time to think about deep cleaning them. It isn’t a difficult feat, one we’ve already outlined in a prior post. There are several heavy-duty carpet cleaners you should consider when determining which is best for your floor, and keep in mind that lighter carpets stain more easily, thus stains are more apparent, so they require greater cleaning strength. 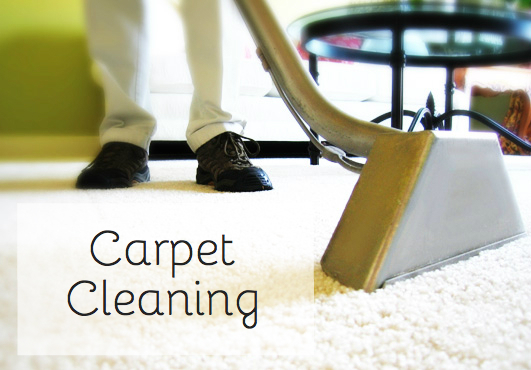 Find a full range of carpet cleaners here. 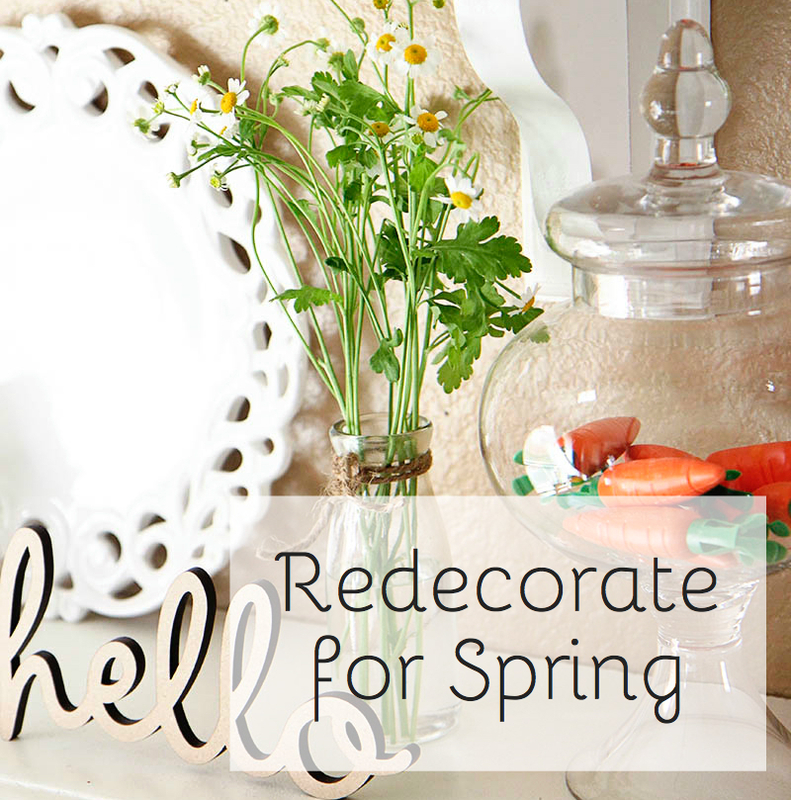 Spring means fresh and new, so give your home a little life by rearranging furniture, repainting select rooms, switching out decor (i.e. pillows, pictures, curtains, etc. ), upgrading fixtures or changing up your style altogether. If you need a little inspiration, check out some of the posts we’ve written recently with specific DIY project how-to’s. I’m sure there are many other Spring Cleaning projects, so tell us in the comment section below what some of yours are, we would love to hear them! And as always, let us know what questions you have, or if you need advice on which tools will help you effectively complete a project. For the gardener and do-it-yourself landscaper, springtime is nature’s way of giving you a little breathing space, a moment to reflect on how your yard creations are holding up through the tests of weather and time before the real growing season begins. Once you clear away winter’s debris, mulch or dead twigs, you can decide where to focus your efforts. Whether it be thinning out crowded areas, filling in bare spots or preparing your yard for new growth, buds and blooms. 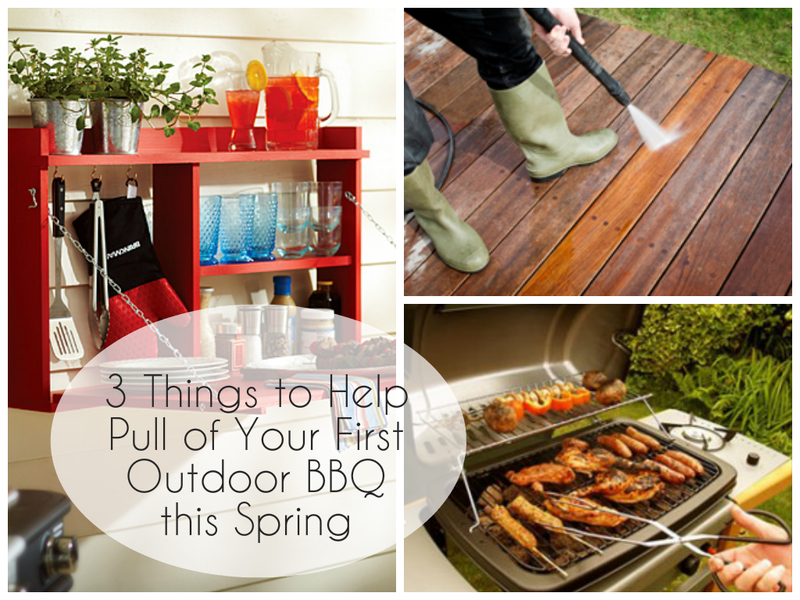 Here’s what you’ll need to start your spring clean-up and give your yard a fresh start. If you’ve got a lot of clean-up to do, and you like trying out different kinds of equipment, consider renting a soil conditioner attachment. You can grade, soften, mix, level, rake, remove debris as well as pulverize and prepare seedbeds, remove entire lawns and weeds, all with this one tool that attaches to a Bobcat. Sweet! Prune dead and damaged branches back to live stems and clip off wayward shoots to an intersecting branch. Summer-flowering shrubs should be pruned before the plant buds. Wait to prune spring-flowering plants until after blooms fade. Trim overgrown evergreens back, starting from the bottom of the tree trunk to eliminate dead branches and encourage an appealing tree shape. Cut back flowering perennials to a height of 4–5 inches and ornamental grasses to 2–3 inches, which encourages new growth. Thin crowded beds by digging up perennial bulbs. Instead of throwing them away, divide the extra bulbs, leaving at least three stems per clump, and transplant them in other areas of the yard. If rose bushes are winter-damaged, cut back to 1 inch below the blackened area. Remove older woody canes on climbing rose bushes, fastening younger canes gently in place with jute twine or Velcro fasteners. Rake out fallen leaves, dead foliage and annuals, as well as spent mulch to prepare for a new layer once your planting is finished. Spread an appropriate fertilizer for existing plantings on the soil’s surface so that April showers can carry it to the roots. Inspect any drip irrigation lines and repair if necessary. Give beds a clean edge with a shovel or a weed eater. Remove damaged grass turf to prepare for spring seeding. It’s also a good time to test the soil’s pH and add an appropriate fertilizer, if needed. And finally, feed the compost pile! Dump all debris, cuttings, foliage and last season’s mulch into your compost pile, and you’re done…at least until it’s time for spring seeding! And as always, for questions and comments please visit our website or leave a comment in the section below. Happy yard cleaning! With the weather finally warming up and spring in the air, I’ve spent the past few weekends doing DIY projects. The first involved restaining some old furniture, and for the second I patched up all the holes and out-of-use phone outlets in my home. They both turned out really well, so I’m excited to share them with you. This project went so well that I’m doing 2 more pieces. For the first time in my life, I took to staining a piece of furniture that had become discolored. It had come down to change it or trash it. Since it was already finished, it just needed slightly sanded. I used a bucket of water and a washcloth to get rid of the powder and wiped it down. Then I bought stain with poly something or the other to stain and protect at the same time. I think the name was mini something in a satin finish, but you can get gloss too. The trick is to always go to a darker shade. Two coats did the trick and it looks great. I was quite pleased with myself, so I decided to do 2 more pieces, one that’s too oak gold for my taste and the other just to restore its original color. This is an easy project with a dynamic effect! My husband and I had our house built, and like many people at the time we had phones installed. Now, with cell phones and satellite internet I decided to kill our landlines. It’s been over 5 years since we’ve used it, and for a time we had a picture over the box to cover the hideous plastic kitchen outlet. However, I finally decided to fix it all together, so I bought a drywall kit and mud and actually did my first patch. I had so much fun that not only did I cover the old phone outlet, but I removed every picture and nail in my home and patched every hole. I repainted them and now I’m ready to rehang the pictures, but at the right height. These are only two DIY project ideas; there are so many others! We’d love for you to share your successful past projects in the comment section below. And as always, be sure to ask your questions about these and any other tips and tricks of the trade! Tile is a beautiful thing. At first glance tile can seem like an expensive accent for your walls or floors. Not to mention, a time-consuming, specialized do-it-yourself job to boot. The good news: making a stylish upgrade to your kitchen or bathroom with a tile backsplash or floor makeover adds value to your home, and you don’t have to spend a lot of money or time doing it. 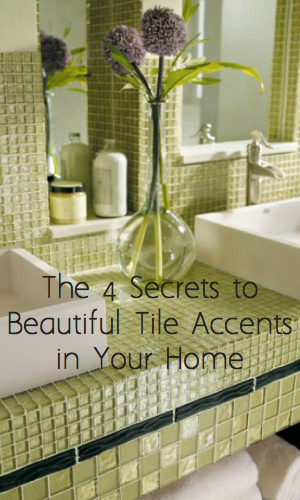 The secret: embellish your living space with beautiful tile accents. 1. Create a focal point around cooking areas in the kitchen or in back of a bathroom sink. Mix and match different tile colors, textures, metals, glass and ceramic, or use more expensive tile along with more affordable options, to create a pattern. Consider the look of the counter – intricate backsplashes look great with solid countertops. On a floor, create a tile “rug” in the center of an entryway or in front of a backroom counter. 2. Accent the entire room by wrapping it with the tile backsplash design, which can help make a small space seem larger. In the same way, wrapping a floor with a tile border can look pretty spiffy. 3. Use affordable tile in unusual ways. Place tile vertically or on a diagonal. Simply by changing the orientation of inexpensive subway or field tile, you can give it a modern look. 4. Plan your design, right on the wall or floor by prepping the surface to be tiled with a layer of white thinset. Once it’s dry, draw the design with pencil. Even easier: splurge for tile that’s sold already in pattern. Follow these steps for a beautiful tile project. Regardless of the type of tile project you decide on, the following steps will start you on your way. Step 1: Prepare the substrate. Substrate is the surface to be tiled and can be made from drywall, cement board, plywood or other type of backing. Tape, plaster or mud the substrate seams so the surface is smooth. After this work is complete, make sure the surface is free of dust, oils or residues to guarantee a strong adhesive bond. Step 2: Plan tile design. Draw the design with pencil, directly on the prepared surface to be tiled, or snap chalk lines to be used as guidelines, measuring to determine the best location to start tiling. Allow full tiles to be places in areas that draw the most attention and hide cuts in corners and under cabinets. Step 3: Apply mortar. Spread adhesive with the flat side of the trowel, flip the trowel over to the notched side and double back over the area to remove any excess. Cover the entire surface with a medium-thick layer of adhesive. Step 4: Install tiles. Begin installing full tiles or tile sheets, working off of the countertop surface, or one corner of a floor and move up or out. Step 5: Make cuts. Make cuts to fit tiles around electrical, cabinets, light fixtures, toilets or bathtubs, and then fit the tiles into the design. As always, contact us with any questions on your tile projects, or comment below. We’re here to help! The reports are in — the last six months have been the coldest for much of the country in the last 100 years. That’s quite a statistic, extending from mid-fall in October all the way through this record-breaking winter that continues to whiteout snowfall totals, in addition to low temps. Is there still a chance to save a little money on heating costs this year, or save up for next? Perhaps… if you have a fireplace, an insert or wood-burning stove, and a lot of fallen wood in your yard from all those winter storms. 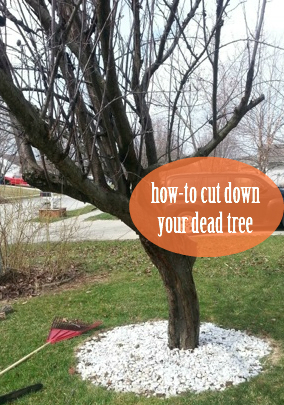 Fallen limbs and tree debris can come in large pieces, so you’ll need to cut it down to size. Once you’ve gathered the stash, use a chainsaw to chop up long slender branches and medium-sized chunks to a size that fits easily into your fireplace or wood stove. If an entire tree has fallen, remove smaller branches right at the site, then use a log splitter to cut up the bigger trunk. You’ll probably work up a bit of sweat doing this kind of yard work – and make a bit of a mess, too – but nothing needs to go to waste. Rent a wood chipper and make mulch from all the little pieces. Your garden will thank you later this spring! If the fallen debris is wet wood, cut it up anyway and stack it for use next winter. Proper seasoning takes at least a year, more if the stack is covered with a tarp, slowing moisture evaporation. The best-burning wood has been seasoned for two to three years. 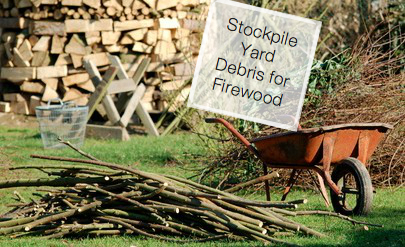 Although it is finally warming up, and building a fire may not be as necessary anymore, why not use your yard debris for firewood and tinder next year? Stock pile it and then you have one less thing to worry about come October. If you have additional questions, contact us here. And, any other ideas for how to use yard debris? Share your ideas in the comment section below. Now that the clocks have “sprung forward,” and the official start to spring is just days away, why not make plans for that outdoor herb garden you’ve always wanted? A strategically placed herb garden will not only enhance the flavor of your culinary creations, it can help to beautify your yard too. 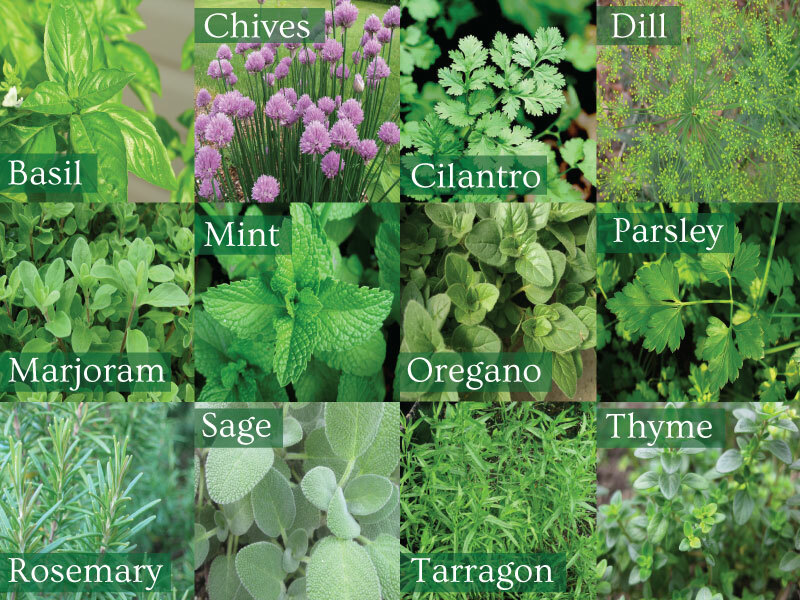 Here are a few ideas for creating an herb garden that just may cool your spring fever! 1. Start with the herbs. Kitchen herbs are also good-looking plants, lending a visual appeal to a garden bed. Experts suggest choosing plants with variegated leaves or that bloom in different colors. Thyme, oregano and mint come in variegated versions, while certain varieties of basil have deep purple leaves. For added interest, choose varieties with unusual texture, such as the velvety gray-green leaves of Berggarten sage. Remember to choose for fragrance too – the luscious lemon thyme gives off the bright scent of citrus, as do the lovely lavender flowers of rosemary. Mints not only smell and taste minty, but some carry the flavor of chocolate or pear. French tarragon tastes and smells of licorice or anise, while rosemary itself adds a woodsy pine scent. Other landscaping supplies you’ll need are a wheel barrow, watering can or hose, rake, shovel and fertilizer. 2. Plant close to your kitchen door. Herbs will thrive in a surprisingly small space. To make the best use of space near your kitchen door, measure an area of the ground with a measuring tool and prepare the soil. 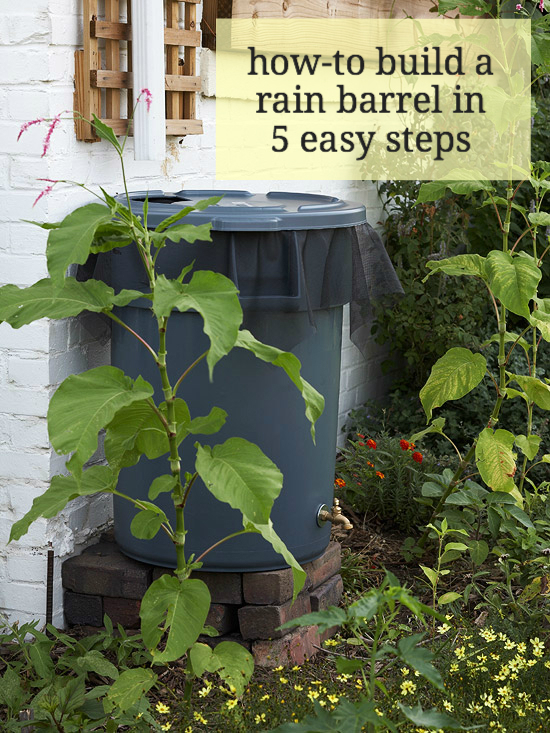 Place the plants of herbs you’re most likely to use closest to the door – say, about 20 paces away – so you can snip a few easily during a rainstorm, for instance. Add to your herb garden by planting more varieties in clay pots, which can be moved to sunny spots more easily. 3. Create an herb border. Include culinary herbs in your landscape design by planting the edge of a sidewalk with herbs instead of flowers. Hearty herbs like rosemary and thyme can have the same effect as small shrubs. Create a geometrical bedding design in your backyard, with pathways for walking by and smelling the sweet fragrances. 4. Build raised beds for growing herbs. Just like with vegetables, fresh herbs will grow well in raised beds, too. And if you just want a small spot for growing herbs, build yourself a planter to place on a patio, porch or deck. Buy a few two by fours and other wood for a bottom from the hardware store, cut to size, nail together and you’re set. Remember to drill holes in the bottom for drainage. Others have had luck with using plastic trowels inside as a planting form. Or, you can simply use a large bag of potting soil – build the planter the right size to hold the soil bag on its side, then cut a few drain holes in one side of the bag and cut the other side open neatly with a pair of scissors, discarding the excess plastic. Plant the herbs directly into the soil, water and you’ve got herbs in due time. 5. Reap your harvest. One of the best parts of growing culinary herbs is using them! Take care cutting herbs in a landscape border, but most re-grow quickly after harvesting, so your beautiful garden can stay beautiful. Herbs are perfect for tossing in food during the summer, but you can also dry them for the winter. Cut and wash, rubber band the bunches together and let them dry upside down. This way each bundle retains its color. It takes them about a week to dry out, but once they are, remove the leaves from the stem and grind in a coffee grinder. Finally, put in plastic bags and write the herb name and date. I also put them in tins and give them to neighbors and friends! Write your great ideas for how to use and preserve herbs in the comment section below, or contact us for more details on how to make your garden this spring. I think we can all agree that winter can end any time now and that it’s getting a little tiresome to stay inside all the time. Feels like you are looking at the same old stuff over and over. Instead of lamenting about the weather and boredom, get busy and do a low-budget and super fun bedroom makeover. There are so many things that you can do to change things up with just a few tools and a few hours of your time. 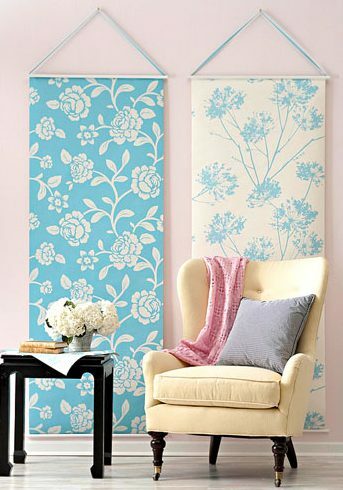 Compiled below are a few awesome custom headboard ideas from Pinterest. Each is accomplishable, even if you don’t have a construction or craft background. Think of the challenge as a good thing. You may even learn a new skill to use over and over again! This Upholstered Headboard can update and change up a room quite a bit. The creator went for the “belgrave” shape but you can choose from so many here! I personally love the “Cavendish” & “Eccleston” shapes, if I get the chance to make a headboard I will pick one of these shapes no doubt. And the beauty of this project is that you can get it done with just a few supplies: a circular saw and a jigsaw. I love that this girl is not only doing the project, but she already owns the tools mentioned. Talk about inspiring, her husband hassled her about her ability to make the headboard, and she nailed it. Not only did she nail it though, but her husband was IMPRESSED! This Tufted Headboard transforms a room and offers a comfortable, serene look and feel, and who doesn’t want that in a bedroom? This is a simple project that can go smoothly if you plan your work and work your plan effectively. First things first: gather all the supplies you would need. For this project you are looking for: plywood, a saw, tape measure, sharpie, carpenters pencil, drill and drill bit, spray adhesive, foam, batting, fabric, and lastly buttons. After you have gathered all your supplies you can get down to business and create your luxurious new headboard. It’s pretty amazing what can be accomplished with a little time and energy. What about something a little less traditional like a Headboard Shelf? Consider a functional headboard that can altar the whole tone of your boudoir without breaking the bank, or your back! You need so little to complete this project: a 1×10, 1×8, 1×6, shelf supports, wood screws, finish nails, crown molding, stain, a drill and a jigsaw. When you get all your measurements, remember to measure twice and cut once. 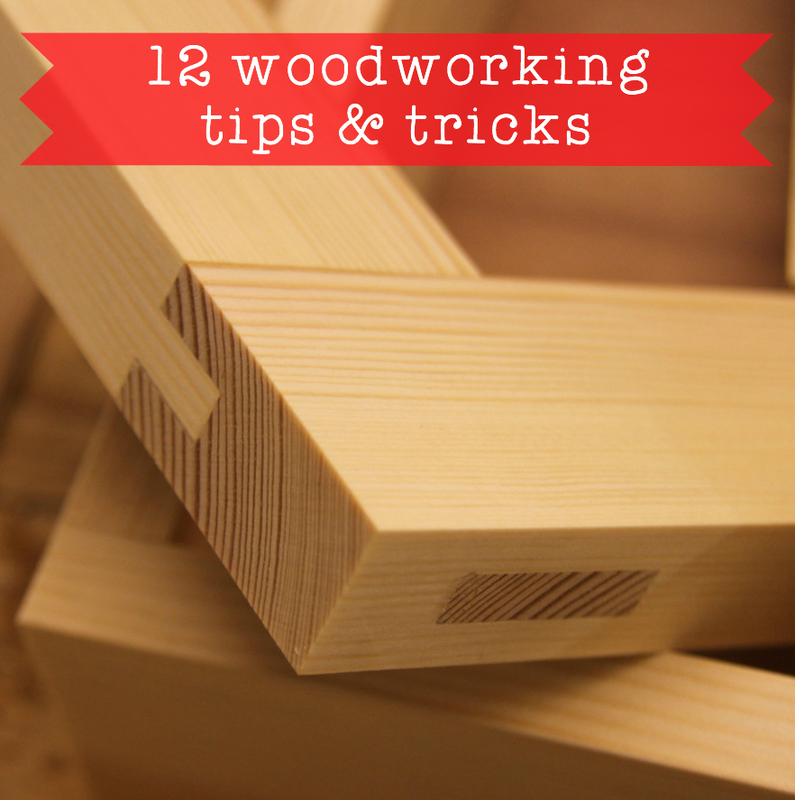 It can be tricky to get it right at first, but it’s important you cut accurately. Once you get everything assembled and stained, get it mounted. Then, voila! You have a handy, yet attractive new addition above your bed, the perfect spot for your favorite trinkets, pictures and decor. A Repurposed Door Headboard will instantly add character to your bedroom. For this project you’ll need an old door, crown molding, paint, fabric, nailhead trim, glaze, a nail gun or drill and a jigsaw. This headboard creates a serious change with major attitude. The possibilities are endless with this upcycle, it just depends on how intricate you want to make it. Have any questions about these four projects, or if you’ve built, altered, or repurposed your own, let us know in the comments below!